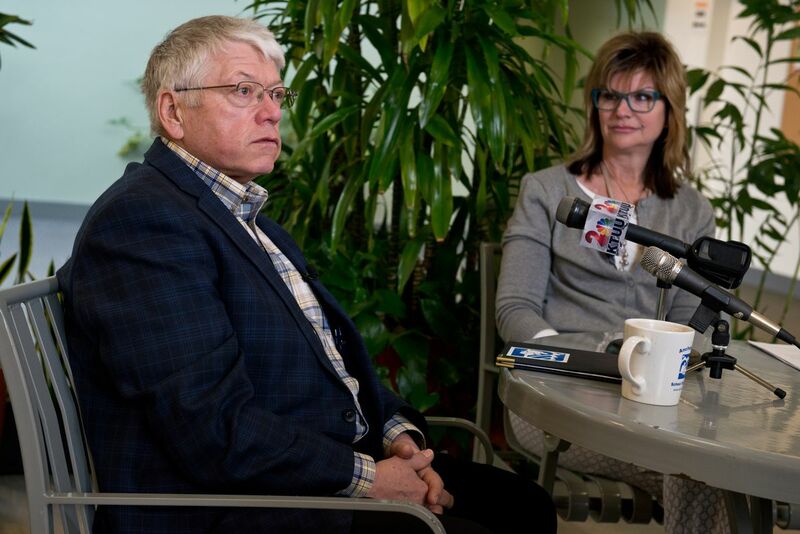 The Anchorage School District announced Friday that it planned to lay off about 200 teachers as it grappled with budget uncertainty and faced a deadline in state law for handing out pink slips. "With the uncertainty that the school district is facing with funding, we have to be prepared to meet our financial obligations," Todd Hess, district chief human resources officer, said in an interview with reporters Friday. The number of teachers who get rehired depends on the budget passed by the Alaska Legislature. Lawmakers have blown past their 90-day deadline and have yet to agree on a state fiscal plan or education funding, with the House proposing flat funding for public schools and the Senate proposing a nearly 6 percent cut. That means the Anchorage School District could face anywhere from about a $15 million to a $42 million budget gap next school year, the superintendent has said. If the school district received the same amount of money next year as it did this year, it would still have to cut 123 full-time staff, including 99 teachers. And if lawmakers went with the Senate proposal, the district would need to eliminate at least an additional 200 positions, said Heidi Embley, school district spokeswoman. State law requires school districts notify tenured teachers of layoffs by May 15 and nontenured teachers by the last day of school, which is in less than two weeks. Hess said he was frustrated that school districts had to meet layoff deadlines without a state budget, forcing districts to pre-emptively issue pink slips to prepare for the deepest possible cuts. "It doesn't make a lot of sense the way the state of Alaska has structured things," he said. Hiring and training new teachers is costly, he said, and the process of determining layoffs also takes time and resources. Hess said the district issued layoff notices to five tenured teachers Friday. It expects to issue the remaining 200 pink slips to nontenured teachers by May 25. Those pink slips will primarily go to first-year teachers, he said. "The thing that's most disturbing to me is that we have a large number of qualified, confident, dedicated employees that we're going to be telling here in a few days that they're going to be out of work through no fault of their own," Hess said. This school year, the district employed about 3,400 teachers. On average, about 200 of the district's teachers resign or retire each year. The announcement of 200 pink slips led to uncertainty and worry among district teachers. Brinna Wojtalewicz, president of Anchorage Education Association teachers union, said in an interview Thursday that she had received numerous phone calls and emails this week from teachers worried over whether or not they should expect a layoff notice. "There's a ton of angst, at least among the first- and second-year teachers," she said. Across the state, school district officials said in interviews this week that they had stalled hiring or dug into their saving accounts to cope with anticipated budget gaps. Some cut positions and programs. Some prepared to increase class sizes. Some issued pink slips. The Fairbanks North Star Borough School District issued layoff notices to all 192 nontenured teachers at the end of April. Sharice Walker, school district spokeswoman, said on Thursday that the district planned to send layoff notices to six tenured teachers the following day. The Matanuska-Susitna Borough School District issued layoff notices to 15 teachers, 14 school aides and 30 custodians, said district spokeswoman Catherine Esary. Another 130 special education assistants and 14 records specialists were notified that their hours were being reduced. The district also planned to increase class sizes to unprecedented levels. Together, the Fairbanks, Mat-Su and Anchorage districts enroll about 60 percent of Alaska's public school students, with the remaining students split across 51 other school districts. The funding proposal from the state Senate would eliminate $69 million in funding across the districts. Rep. Matt Claman, D-Anchorage, said in an interview Friday that he was optimistic a House-Senate conference committee would compromise on a budget that included education funding closer to the House proposal. He described the teacher layoffs as "troubling." "Sadly, we've seen these before — it's one of the challenges we get when we don't finish our work in the 90 days like the voters had asked us to," Claman said. Sen. Peter Micciche, R-Soldotna, the Senate majority leader, said in a statement Friday that he also expected budget compromises to emerge from a House-Senate conference committee, including on education. Several school superintendents interviewed this week called for the state to forward fund education so schools could better plan and not delay hiring teachers while they waited on the Legislature. In the Kenai Peninsula Borough School District, superintendent Sean Dusek said the district was holding off on hiring for 30 positions pending a decision by the Legislature. He said the district would typically start recruiting as early as January or February, but because of the delay it had lost interested candidates to other districts. "I don't see how the legislative calendar works well for schools," he said. "I really hope, even in these tight times, that they figure out a way to fund us a year in advance." Bill Hill, superintendent of the Bristol Bay Borough School District, said that over the past few years the district of about 115 students had eliminated its art teacher, music teacher and counselor due to budget cuts. He said the district and borough were digging into their savings to plug the anticipated funding gap, and decried the annual budgetary guessing game when it came to state funding. "It's a horrible way to run school districts," he said. "The uncertainty in the budget goes all the way down to our children. They feel it. Our community feels it. Uncertainty is not a healthy thing." Claman said he understood the importance of forward funding, but it did not seem possible this session. Micciche also said in his statement that while there were discussions taking place about forward funding, he doubted it would occur this year.